House and time at Malvern: No 6, 1905 - 1911. Regiment: 59 Sq. R. F. C.
Died: 04 March 1917 aged 25 in France. Killed in action near Monchy-au-Bois. Son of Thomas and Florence Herbert Hill, of East View, Uxbridge, Middx. Born at Ewell, Surrey, May 27th 1892. Scholar of Magdalene College, Cambridge. Gazetted to 10th Bn. The Rifle Brigade Aug., 1914. Previously wounded Oct., 1915. Joined R.F.C. in 1916. 59th Sqdn. Royal Flying Corps and General List. 'Beresford Hill gained no distinction at games, but no boy at Malvern, in his day, was better known or more highly respected. He owed his position to his scholarly taste, his genial buoyant temperament, and the obvious uprightness and honesty of his character. Few boys have exercised a wider, certainly none a more wholesome, influence over their fellows, and it is safe to say that no one came into contact with him that was not the better for it. Let us give him the highest praise at our command, and say that he was one of the finest type of Public School boys. Nothing can be added to that praise.' (Malvernian, Apr 1917). In 1892 he was educated at Mr. Worsley's, Evelyns, Hillingdon, and at Malvern College, where he held a classical scholarship. On leaving Malvern he was given a leaving scholarship, and he also won an open classical scholarship at Magdalene College, Cambridge, and went up in October, 1911, taking his degree in 1914. He served in the Cambridge O.T.C. for three years, and on the outbreak of war was given a commission in the Rifle Brigade. He went to the front in July, 1915, and was wounded in October, 1915. 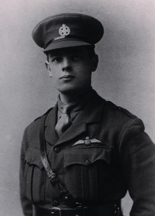 On his recovery he entered the Royal Flying Corps in April, 1916, and returned to the front as a pilot in February 1917. He was killed in aerial action near Arras on 4 March, while fighting against four hostile aeroplanes, which attacked him as he was returning from photographing the German lines in his plane RE8 (A4163) when he was shot down and killed by Leutnant Renatus Theiller from Jasta 5.